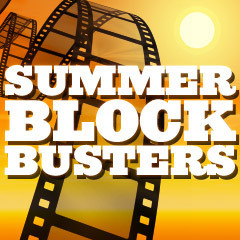 Top Summer Blockbusters of All-Time: These are the top 25 Summer Blockbusters, according to their total US domestic gross revenue rankings (doesn't include revenue from re-releases, re-issues, or 3-D), to fairly accurately show which films have been the largest blockbusters during the summer months. All of the films in the top 25 earned over $300 million, opened in the summer, and were since 1980. The Summer Season is measured from the first Friday in May through Labor Day Weekend. A short summary description of each film is included. A few other sites post all-time box-office information, including the Internet Movie DataBase, Boxoffice.com, Boxofficemojo.com, and The-numbers.com. The 100 Greatest Films that have been selected at this site are identified throughout by a yellow star . A sequel to The Incredibles (2004), with Elastigirl (Helen) as the star super-hero battling against new supervillain Screenslaver, while Mr. Incredible took on domestic chores. The sequel to the 2012 hit film, and the 11th film in Marvel's Cinematic Universe. Tony Stark/Iron Man (Robert Downey, Jr.) and other Avengers superheroes, including Captain America, Thor, The Incredible Hulk, Black Widow and Hawkeye battled the terrifying technological villain Ultron (James Spader), a mechanical AI with the goal of human extinction. In the last of director Christopher Nolan's trilogy of Batman films, the caped superhero Dark Knight (Christian Bale), aka Bruce Wayne, battled a masked villain named Bane (Tom Hardy) to save Gotham City. Set three years after the previous film (Jurassic World (2015)), the island of Isla Nublar was abandoned and the theme park was closed down, but its dormant volcano erupted, causing a massive effort to rescue the dinosaurs and prevent them from becoming extinct. The epic adventure and origin story of the former princess of the Amazons named Diana Prince, who became a super-warrioress, after being raised and trained on a paradisical island and transported to World War I-era London. Another blockbuster sequel in the Marvel Cinematic Universe (the 7th), featuring billionaire industrialist Tony Stark and his alter-ego, Iron Man pitted against a formidable terrorist called the Mandarin. Marvel's fantasy-sci-fi sequel to its previous 2014 film (with a gross of $333.2 million), about a team of extra-terrestrial misfit superheroes led by Peter Quill (aka Star-Lord) (Chris Pratt), who was to learn about his true parentage.